What the Hell Is Wrong with You Black People? 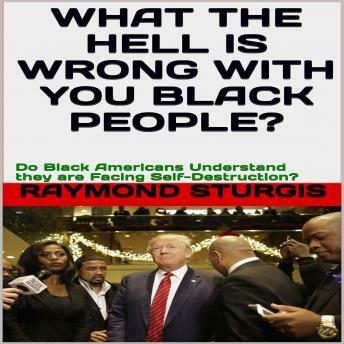 : Do Black Americans Understand they are Facing Self-Destruction? The condition of African Americans today is quite alarming and disturbing. African Americans have an enormous amount of contributions from their ancestors to advance in positive and productive directions. However, black Americans' advancement in technology, science, music, arts, and business is overshadowed by black-on-black crime and poor family values. What is the reason why so many black people have lost respect, hope, and pride in the very achievements that enable them to enrich their children's future? Where is the love and pride that can elevate blacks to support black businesses, housing. and human life? What the Hell Is Wrong with You Black People? is asking a question of the murderers and deviants of black communities, to dysfunctional families and hopeless youth who feel they have no contributions to their race. The world will always have a microscope on blacks in America, because for centuries blacks have inspired other minorities and victims of discrimination to believe that they, too, can overcome. Today, African Americans are more concerned about surviving the violence in their neighborhoods than creating businesses, enriching children's minds with love, or fighting for better schools. African Americans are too preoccupied with crime and poor economic conditions to save their children from hopelessness and low self-esteem. The future of today's youth depends on how well we encourage their dreams of success, and if the only dream they have is surviving gun violence, where does that leave African Americans' future? How many deaths will it take for African Americans to understand their plight?